I finally got to see Peyton play—against Newman's rival, Country Day, a small private school from nearby Old Metairie. Peyton towered over all the other players, and he was mesmerizing from the moment I saw him on the field. Each of his passes seemed to possess its own genius. He threw a soft ball even when he threw hard, meaning his passes traveled the way receivers like them to: nose tilted slightly upward, making them easier to catch. The game was a blowout, but I felt lucky to see Peyton at this point in his football life. Seventeen, I kept reminding myself. In my notebook I scribbled riffs about his confidence, his preternatural gifts and the expression of joy on his face as he faked out defenders on a blind bootleg. My favorite moment came when the Country Day coach yelled at the refs to stop watching Peyton and to start watching the game. 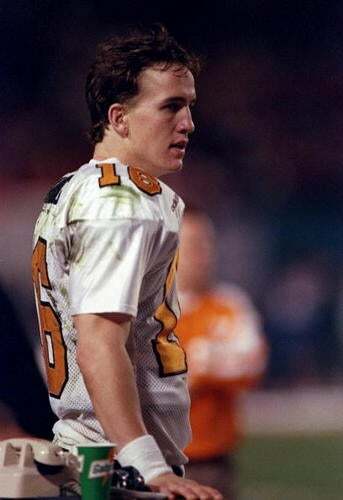 "I honestly don't know where I'm going," Peyton had told me that week. But I did, and in my estimation the college he chose probably wouldn't matter much. I could see with clarity the destiny that awaited him. While I didn't hear any complicated audibles before the snap or observe any odd gesticulating at the line, he still displayed a braininess that communicated a superior understanding of the game. The arm, the size, the footwork—all there in abundance. The courage, the leadership, the will; those as well. And with his family behind him there was no way he would fail the character tests that were sure to find him once he left home. Late in the game I looked at Archie and said, "I understand now why everybody wants him. He's going to be one of the best ever." And here is John Ed's 1993 SI feature on Manning.